Fabrisonic’s unique additive manufacturing utilizes ultrasonic welding to 3D print. This ultrasonic process is called solid-state welding. Solid-state just means there is no melting, all of the bonding occurs without a phase change. Unlike powder bed fusion where powder is melted, Fabrisonic’s technique scrubs off the layer of oxide that usually prevents the metals from naturally bonding together. When this oxide layer is removed, a little bit of pressure and a little bit of energy are all that is needed for nature to form a true metallic bond. For metals such as aluminum, the process will not go much above 200°F (lower than the lowest setting on the oven in your kitchen). To see an infographic about how the solid-state science works, click HERE. For more information on the process, feel free to check out our website or contact us as any time by email or phone. Metal 3D printing provides engineers and manufacturers with a completely new level of design freedom. One specific example of this is the ability to safely embed sensitive electronics in solid metal. 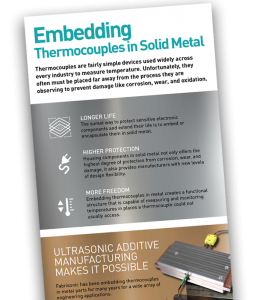 Our new infographic, Embedding Thermocouples in Solid Metal, shows how Fabrisonic’s ultrasonic additive manufacturing technology uniquely does what conventional joining cannot—that is, encasing thermocouples in metal without damage to protect and extend their life.